Pure rutin, a bioflavonoid from 100% natural saphora japonica, a Japanese flowering plant. 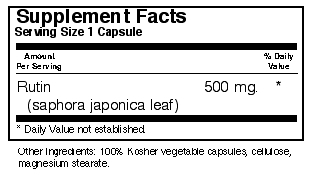 Available in easy-to-swallow vegetable capsules for maximum assimilation and absorption. Kosher Certified. Free Of: milk, egg, fish, crustacean shellfish, tree nuts, peanuts, wheat, and soybeans, corn, yeast, gluten, barley, rice, sodium and sugar.